If You Need Life Insurance And You Have Pre-Existing Conditions, We Know It's Scary And We Can Definitely Help You! Most people are lying to themselves saying that they have no medical problems when it comes to buying life insurance! People are human and often think that their health is simply better than it really is. Folks forget about medications they've been taking , a hospital visit that had a few years ago, and even the most recent doctor visit for those funky abdominal pains he's been having lately. These things are all potential red flags for a life insurance company. life insurance with pre-existing conditions?We are specialist brokers for difficult life insurance cases! Please understand that most Americans are not marathon runners. In fact over the last several decades Americans as a whole have become obese. With obesity and Type 2 diabetes so prevalent, it is more than likely that you might not qualify for life insurance (term life or any other kind) "at standard rates". In fact, "standard rates" might not be available at all. Please understand that obtaining life insurance for people who have pre-existing conditions is difficult. We are specialist brokers for difficult cases and have been helping folks get the vital coverage they need for over 30 years! So, if you can't get "standard life insurance rates", what can you get? Typically, insurance companies have actuarial tables that start at "standard" rates, which is basically "average". Nothing special, but the "standard" rates are like "rack rates" at a hotel- they are the "average" published rates for which most folks can qualify. Rack rate at a hotel are the average published rates. "Standard rates" do not reflect any sort of discounts based on "lifestyle choices" like not smoking, being physically fit, having low cholesterol readings, not engaging in hazardous activities, etc. These "lifestyle" discounts are just that- rewards for being better-than-average mortality risks. Obviously, a non-smoker will generally live longer than a smoker, all other things being equal. The same goes for folks with high cholesterol, and height/weight issues. Term life insurance rates start with a "standard" rate as a baseline and then can improve with discount. What happens if someone has more severe medical conditions, or "impairments" as they are know in the life insurance world? Just as discounts are applied to "standard" rates, surcharges, or "table ratings" are ADDED to "standard" rates in order to accurately reflect the insurance company outlook on a specific risk. Table ratings start at "table A" and go as high as "table F" typically. Each table usually represents an additional 50% increase in the cost of insurance. So, if you get an offer of "table D" that would mean that the insurance company wants to charge you 200% more than "standard"rates. Conditions that would merit such extra costs would be past history of certain heart conditions, massive high cholesterol, more severe diabetes conditions (not controlled well), past history of certain cancer treatment, participation in hazardous activities such as hang gliding, parachuting, vehicle racing, etc. You can begin to see how the conservative life insurance companies view certain "lifestyle" choices we all make and how they reflect our choices in their outlook on our risk in the rates they charge for term insurance. What do I do if I think i might be turned down for life insurance with pre-existing conditions? First, don't panic and decide not to pursue protecting your family! If you've already been turned down, or "declined" for life insurance or you think you might be, it's best that you first discuss your situation with an independent life insurance broker. We've been helping families find affordable life insurance since 1985. At that time there were very few insurance companies who wanted to insure people with pre-exisiting conditions. 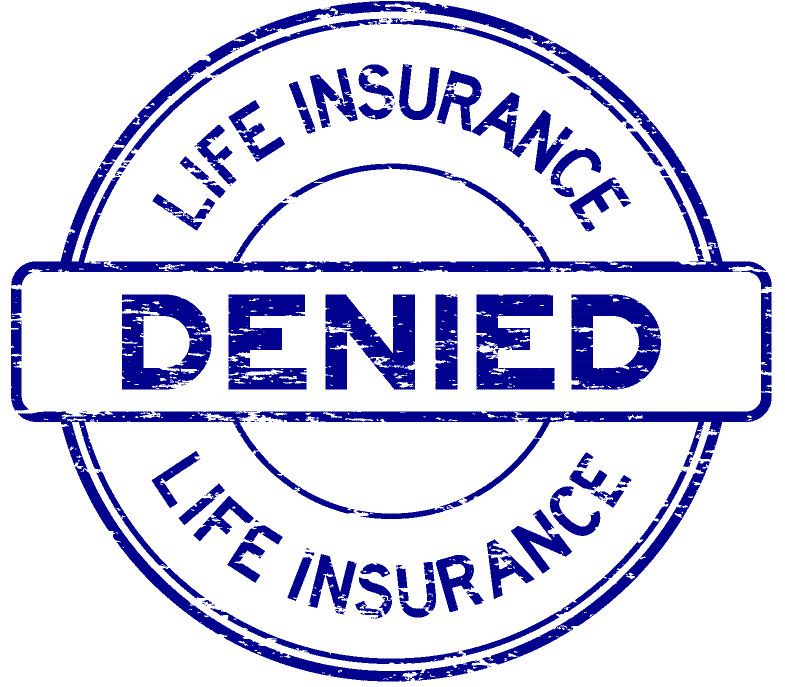 Now, there are companies who accept many high risk individuals, when 30 years ago they would have been declined altogether or so heavily table-rated that the premium would have been unaffordable, negating the using life insurance to protect the family. After discussing your situation in detail, we, as independent brokers, will evaluate your risk and solicit "preliminary offers" from certain specialty companies with whom we have relationships and solid working history. We NEVER ask that you get a medical exam for life insurance before assessing your risk as much as possible based on our discussion! If you are encouraged by any life insurance agent to get a medical exam before verbal consultation, we recommend seeking another qualified professional opinion. Why would you put yourself through the discomfort and inconvenience of a medical exam if you would not have qualified with that company in the first place? This is a "rookie mistake" and should not be tolerated. Most of the time when you are asked to complete a medical exam by an an agent who has the name of a specific insurance company on his business card, it's because he's being pressured by his sales manager to produce an application. Motivating a client to take action and protect his family with quality life insurance not necessarily a bad thing, but putting people through unnecessary testing and raising expectations is not ethical either, in our opinion. So remember, we are hear to consult with you about your life insurance needs. We are completely independent brokers and will guide you through the life insurance maze, from initial quote to policy delivery. We will set realistic expectations about what you can expect to get if and when you apply for term life insurance. And we will never push you to get unnecessary medical exams if we don't think it will prove fruitful to do so. That is total transparency and we pride ourselves on dealing with families and individuals in a completely ethical manner!